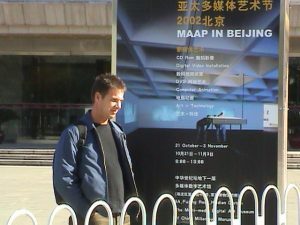 In 2002 MAAP became a mobile Asia Pacific new media organization with the MAAP in Beijing exhibition hosted by the China Millennium Monument Art Museum with the support of The China International Exhibitions Agency, The Gohua Group, The Central Academy of Fine Arts and the Australian Embassy in Beijing. The festival theme of ‘moist’ suggested a conductive environment of cultural ideas recognising the non-linear and pluralist characteristics of contemporary art, culture and society in which artists are looked to as mediators and explorers of maturing and evolving networked understandings. Whereas a traditional view of technology suggests a dry functioning environment where moisture is an enemy of electrical existence, an organic approach may appreciate moisture as an essential element of growth and life. The MAAP in Beijing 2002 exhibition with associated artist talks and symposium intended to set an atmosphere and attitude to an intimate experience of art and technology, transcending the hype and speed of rapid change. The multifaceted festival provided a platform for consideration of the cross-fertilisation, seepage residue of artists working to extend the functions of media and technology within the human sphere and on a human scale. A moist relationship to art was proposed as intimate, close and powerful. The festival was held on the occasion of the 30th anniversary of diplomatic relations between China and Australia and as such tended towards the presentation of more Australian content than in previous years. The core programme presented 19 works at the Art Museum of China Millennium Monument, including utilising the recently installed 31 metre video wall containing 56 programmable monitors. Several artists developed works specifically for this exceptional context including leading Chinese media artist Zhang Peili’s exploration of ‘media humanity’ Broadcasting at the Same Time, Wang Gong Xin’s panoramic and sublime My Sun, as well as the hybrid arts/science work Web of Life by Jeffery Shaw and a team from the ZKM Art and Media Centre (Karlsruhe). Following a month-long artist residency at The Central Academy of Fine Arts, Australian artist Justine Cooper presented the video light microscopy project moist, also developed specifically for the video wall. Some works demonstrated and explored complex computational systems such as Peter Callas’s retrospective of animation anti-train, John Tonkin’s Personal Eugenics installation, Masaki Fujihata’s Palpability and Ian Haig’s Excellsior 3000. Other works challenged conceptual understandings of new media including Odyssey Project by Steven Little which sent the first visual art work to the moon, as well as Wang Peng’s play with the materiality of digital devices in CD Fan, Reality and Sound. A final contingent of works used strong visual statements to carry conceptual gestures such as works by YOUNG HAE CHANG HEAVY INDUSTRIES, Patricia Piccini, Candy Factory, Craig Walsh and Joyce Hinterding/David Haines. In addition to this core programme, MAAP in Beijing 2002 presented screening programmes curated by the Australian Centre for the Moving Image, dLux Media Arts, Experimenta Media Arts and Videotage, as well as CD Rom and Net Art Programs by MAAP, the Australian Network for Art and Technology and Art Centre Nabi. 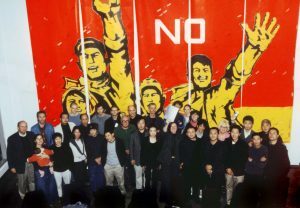 Artists and curators attending ‘MAAP in Beijing – Moist’ 2002. After exhibition dinner celebration. Artist, Craig Walsh outside the China Millennium Monument Art Museum, Beijing standing with the exhibition’s poster featuring his art work. 22 October 2002.